Backyard Fencing For Dogs – What’s My Best Option? Fences and four-legged friends often go hand-in-hand mainly because many dogs can be incredibly inquisitive, need continual stimulation in order to be happy, and they love to explore (your neighbour’s yard, the house down the street, the whole neighbourhood … you name it!). However, constant roaming can often be extremely dangerous for dogs, not just in terms of their own safety, but for the safety of humans and other animals as well. But with so many different breeds and so many fencing options out there, what’s the best choice for your dog? Here is a guide to choosing backyard fencing for dogs. Why Do I Need Backyard Fencing For My Dog? Understanding why dogs jump fences is the first step towards addressing the issue, and this involves ensuring all of your dog’s social, physical and behavioural needs are being met. Some dogs jump fences because they’re bored, lonely or anxious, others aren’t getting the exercise they need, and others again do so because they’ve seen something they want to chase or heard something they want to investigate. Regardless, choosing the right dog fencing isn’t really about keeping your dog locked away, it’s about keeping both your dog and your neighbourhood safe. When dogs are free to roam, bad things can happen and in so many ways. Probably the most serious issue revolves around dogs that are aggressive. That’s why the Brisbane City Council has strict rules on constructing and maintaining fencing around your property, and why failing to provide adequate confinement for your dog can result in hefty fines. No matter how aggressive a dog is, it can’t bite innocent pedestrians if it can’t leave the boundaries of your property, which is why investing in backyard fencing for dogs is so important. What Do I Need To Consider When Looking For The Right Fence? Choosing the right fence for the type of dog that you have can depend on a number of factors. Obviously, if you have a big dog, you’ll need to put a bit more thought into your dog fence design than if you have a smaller dog, mainly because big dogs can be hard to contain. It’s not just their size that can be an issue – bigger dogs can also be more energetic than smaller breeds, meaning they’ll probably be keen to escape the confinements of their backyard to roam around the sights, sounds and smells of the surrounding neighbouring. In this instance, it’s worth opting for a fence that limits your dog’s view, because if they can’t see bike-riding children, owners walking other dogs or even your local postie delivering the mail, they won’t want to chase them! Your dog fencing also needs to be higher than the height your dog can jump and also needs to hamper their ability to climb over it. As a general rule, small dogs need a fence of at least 1.2 metres high (or chest height), medium dogs at least 1.5 metres high (shoulder height), and large dogs at least 1.8 metres high (which should be above head height). When looking at your dog fencing options, you should also consider whether your dog is a digger. To guard against your dog creating a clever escape tunnel, part of your dog fence should be underground by at least a metre in depth. Concrete footing running the length of the fence can also deter digging dogs. And does your dog love to chew? This is another reason to carefully consider what type of dog fencing you choose – dogs with a taste for wooden objects can chew through a fence in a matter of hours! Lastly, creating a backyard that your dog loves will reduce boredom and go a long way towards ensuring they don’t want to escape in the first place. Providing lots of stimuli and ensuring your dog fence encompasses a substantial amount of yard space will keep them not only happy but occupied as well. What Types Of Dog Fencing Materials Should I Consider? Dog fences can be constructed from a range of materials, and some will suit certain breeds rather than others. Solid wood fences, although sturdy, are not ideal for bigger dogs or dogs that love to climb – some dogs will easily push their way through the palings, or use the railings of a wooden fence like the rungs of a ladder to help them escape. Chain or mesh wire fences can suit dogs that don’t typically try to escape, however, these fences are not the strongest and clever dogs will use the footholds to clamber over these as well. Wooden fences with spaced pickets can also be dangerous, as dogs that tend to jump may get their paws lodged between them at the top of the fence, often with horrible consequences. Fences constructed of steel, wrought iron or aluminium are probably some of the best options for dog fencing are they are un-chewable, impossible to climb, and virtually impenetrable. Are Wrought Iron Fences A Good Option? Wrought iron fencing can be a great option when you’re considering backyard fencing for dogs, particularly because many of these fences can be custom made to your requirements. 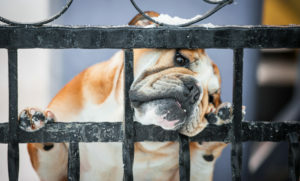 Higher iron fencing can deter bigger dogs from jumping, and wrought iron fences can also be designed so that smaller dogs can’t cleverly wiggle their way between the bars. If your concern centres more around someone breaking in rather than your dog breaking out, then these are also a great option because of their strength and durability. With robust protective coatings and expert installation, iron fences offer premium perimeter security, and act as a strong visual deterrent to not only trespassers but other dogs as well! Need a wrought iron fence that protects both your family and your four-legged friend? Contact the experts at Dean-Wilson Iron on 3814 0076.